Elevate your travel experience with the newest and greatest addition to Newark Liberty International Airport. 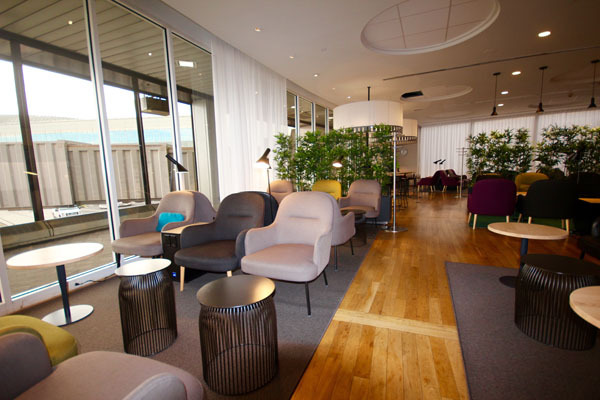 On June 22nd, Scandinavian Airlines (SAS) unveiled their newly upgraded lounge in Terminal B and they deserve a big round of applause. The 440 square meter lounge can now accommodate more passengers and offers a whole lot of luxury while you wait for your flight. If I had a delay and had to stay in this lounge, I don’t think I would mind at all. With upgrades including a revised kitchen with two new serving islands with hot and cold options available throughout the day, three additional restrooms, private guest office and ample outlets and charging stations, this state-of the-art lounge has everything, whether you’re on business or purely for leisure purposes. 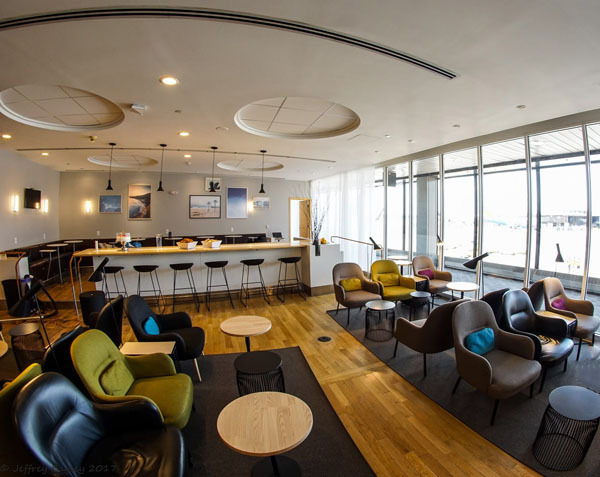 Made with love from Scandinavia, the new SAS Lounge utilizes materials from Scandinavia, to give travellers a gander at Scandinavian roots, which compliments well with the Scandinavian food on offer. Metal and wood contrasts are the hero of this space, as the gorgeous hardwood floors greet you with a warm welcoming. The matte black chairs and small black tables add sophistication to the space, as the clean lines and practical elements are inevitably there for your convenience. Pops of colour are expertly added through furniture and indoor plants to give the space a fresh and playful feel, which I’m sure, is what Scandinavia is all about. The design is so simple, yet offers much character with every little thought out detail, such as the light fixtures, the colour scheme—even the art on the walls is uncomplicated. The miniature conference room is a favourite of mine. 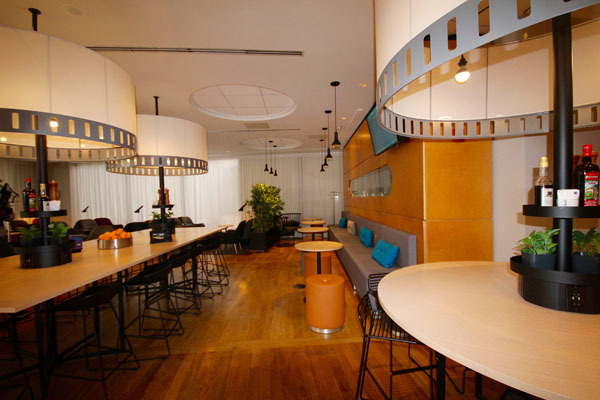 This space adorns the business travellers with a modest private space to conduct business, yet is big enough to hold a small conference with limited people. The room is furnished with a wood top desk, cute black bucket seat chairs, a simple but effective painting hanging on the wall and a good deal of power points, plus USB ports, which is important to all travellers. In addition, the lounge offers an even smaller nook, which is tucked away, for travellers to sit back and relax in a semi private hideout—complete with a comfortable chair and small table. This brand-new lounge really does have it all. The layout simultaneously embodies that of communal and private capabilities. With the communal both of the rectangular type and signature SAS round table style, with matching over head shades, people can gather together to talk about business or sit together and enjoy a meal, just like they would do at home. Natural light flows in with extensive windows surrounding the place, offering views of airplanes flying in and out. The sheer lightweight white curtains offer privacy and add a homey feel, as travellers revel in the luxury without the worry of being watched from the other side of the curtain, as the windows are quite large. Along with the new lounge, SAS has upgraded all of their long-haul flights, making travelling in luxury much more achievable and affordable. The newly redesigned cabin offers comfort and style, with the newly added seats, an updated meal service and even the bedding has been enhanced to offer travellers the finest luxuries. SAS Business offers travellers extra wide seats, which fold out to a bed and have a built in massage function, on demand entertainment system with 15.4” HD screens and individual power and USB ports for all your business needs. The bedding (pillows, blankets and mattress) comes from Hästens, the oldest bed manufacturer in Sweden, which is guaranteed to give you a good nights sleep. With SAS Plus, you can still count on high-class comfort and service, like you would in business. Extra legroom, foot rests, tasty food and drinks inflight and power/USB ports are all the amenities you can find in SAS Plus. The Go cabin has also received a face-lift, with new seats, which recline and a new entertainment system for your benefit. Food and drinks on board and Wi-Fi are available for a small fee. 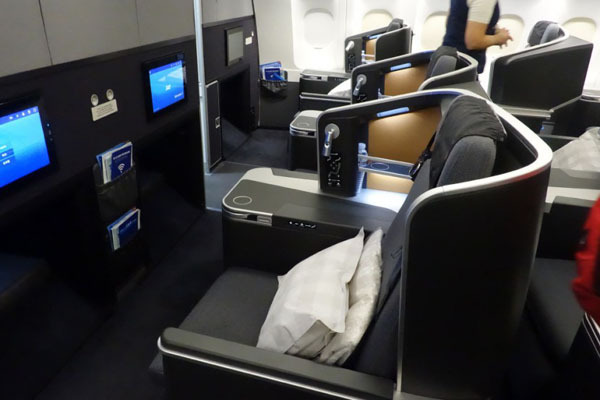 With the new upgrades, SAS should be applauded for their success in offering luxury and style on the ground as well as in the air.